After several months of researching, comparison shopping, and debating we finally took the plunge and ordered a new refrigerator last week. It ended up being delivered yesterday morning! I have to confess that our new refrigerator was not Choice A or Choice B. Choice A was a beautiful 26.8 cubic foot model with twin cooling, french doors, a huge fridge area, separate digital compartment controls,and a pull out drawer freezer area, an instruction manual the size of the phone book ( and a price tag to match)! It was my dream fridge ( the sports car of refrigerators, if you will), but after much measuring and debating, Dear Hubby and I realized that it would barely fit into the area in the kitchen designated for it. Translated - that means we could only open one of the french doors completely, and the other one about a fourth of the way. It would be pretty to look at, but completely impractical. Choice B was also a french door style, smaller, fewer bells and whistles (also cheaper), but it was an off brand and we were concerned about the overall quality. After this little reality check ( I can only drag Dear Hubby appliance shopping so many times, before the novelty wears off) I really started looking at the description tags above each appliance and noticed that french door style refrigerators are not as energy efficient as the Plain Jane single door models. Sigh!!! I went into Lowe's to throw caution to the wind and buy the sporty model ( must be my version of a mid life crisis), and left purchasing the old reliable (mini van) model! Even though this fridge is not what I envisioned, I am completely happy! 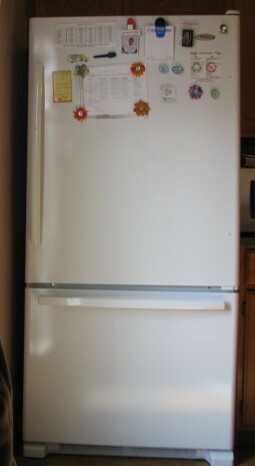 We ended up buying a 24.8 cubic foot Whirlpool single door fridge with a pull out freezer. It had the highest efficiency rating of the appliances we looked at, and replacement parts will be cheaper (important to me, because I do repair and resurrect my appliances for as long as possible). This model was also recently discounted, so by combining a sales promotion to the discounted price we were able to knock the price down from $1099.00 to $841.00. Definitely under what we had budgeted!! WOO HOO!! 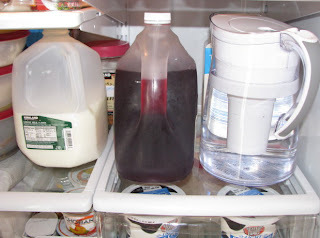 I have wanted to give you all a virtual tour of my fridge for awhile now, to show you all how I maintain a frugal refrigerator. Alas, I have four children constantly spilling in it, and a broken appliance light that made the old fridge a gloomy cave (and impossible to photograph), so I have held off. However, the new fridge is still pristine, so (please) let me show off! I keep all the condiments on the door, within easy reach (and sight of the troops). 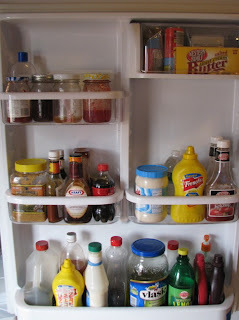 Our main condiments consist of home made jam and jelly, home made pancake syrup, home made salad dressing (that's what in the second mustard bottle on the bottom shelve), minced garlic, barbecue sauce, soy sauce, ketchup, mustard, and mayo. 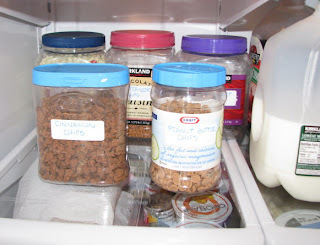 I like to buy these items in bulk (with coupons) at Costco, or matching coupons with sales prices at the grocery store. Behind the butter is a large package of yeast (it will stay fresh for a long time in the fridge). Milk (bought at Costco), juice made from frozen concentrate (much cheaper than fresh juice and stored in a recycled plastic juice jug), and the Brita water pitcher (it is FABULOUS, by the way)are the beverages of choice. This week's juice choice is apple raspberry (bought on sale with coupons) with the juice from two cans of pineapple added to it. A variety of baking chips bought in the bulk section of the grocery store (stored in recycled plastic containers) waiting to be baked into cookies, muffins, and quick bread for breakfast and lunches. 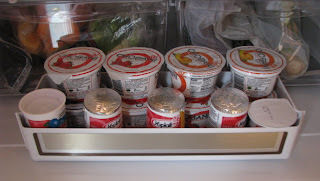 Of course, here are the inevitable leftovers waiting to be eaten for lunch or recycled for dinner. The 5 pound bag of cheese was also purchased at Costco. It was cheaper (per pound) to buy it in bulk. Cheese doesn't last long at my house, so the large quantity is not a worry. I try to keep sliced fruit and veggies handy for snacking. I salvaged the shelf out of the old fridge, and am using it to keep the yogurt organized and within easy reach for breakfast and snacks. Every refrigerator needs a catch all shelf, and this must be mine. 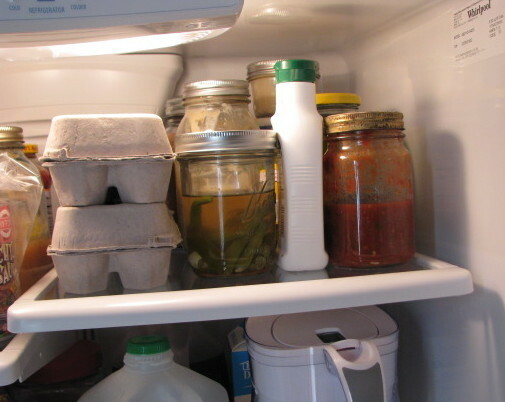 I buy eggs in the 5 dozen bulk pack at Costco or the grocery store (where ever they are the cheapest) and transfer them into smaller egg cartons (saved from previous purchases) for storage when I get home. The mysterious jar with green beans floating in it are dilly beans. One of the by products from last years garden. The other canning jar contains home made salsa (also a by product from last year's garden). The deli drawer is holding tortillas, lunch meat (bought with a coupon) for school lunches and sour cream. The produce drawers are full of fruit and veggies from Bountiful Basket. Now, moving on to the snazzy new freezer compartment! Our old fridge was a 26.0 cubic foot side by side, but the freezer door only opened half way and hit the wall every time I opened it, plus the ice maker blocked the middle of the freezer (and we could never get anything in or out of it). 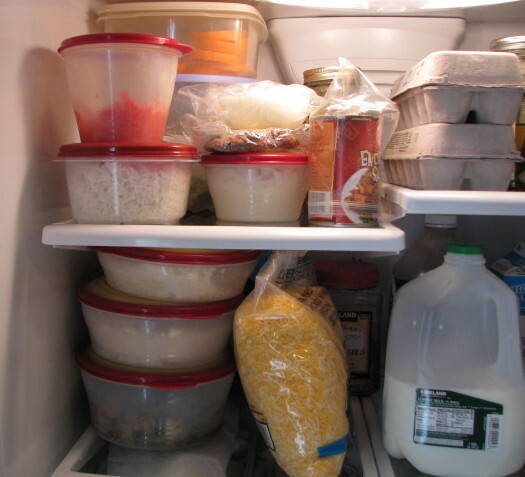 The pull out freezer will eliminate this problem. 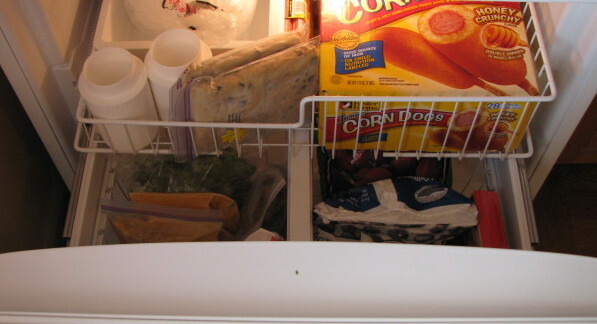 The top drawer holds frozen veggies, the kid's corn dogs (one of my last concessions to convenience foods), Dear Hubby's bag of ice, and a couple of bags of frozen cookie dough. 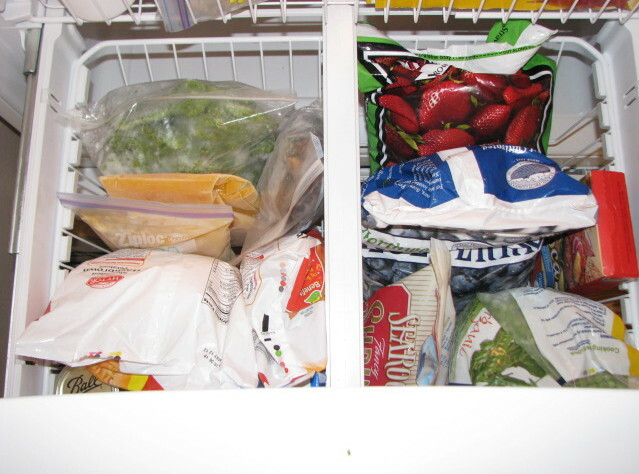 The bottom freezer drawer hold bags of frozen berries (from Costco), frozen peas (also from Costco), frozen squash puree and chopped green peppers from last year's garden, and a couple of bags of hash browns. 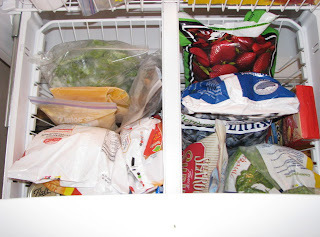 We have a freezer in the garage that holds the rest of the garden bounty, frozen fruit, and our meat. 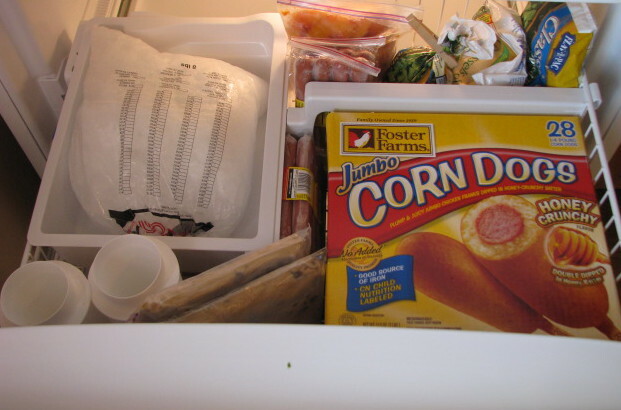 I use this freezer to keep a little bit of every thing handy. I restock it from the big freezer. Each drawer pulls out separately, so every thing is easily accessible. Love, love, LOVE that!! Hopefully, you are not all bored to tears by now!!! Thanks for sharing in my joy! I know, it is a sad day when buying a new appliance is the high point of my week, but to me, a new fridge is better than a trip to Disneyland! Very nice!! 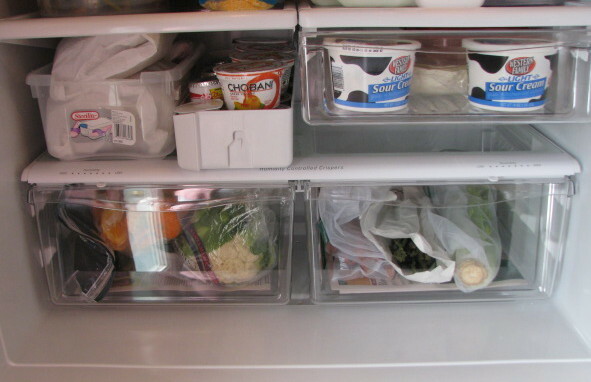 A new fridge makes a ginormous difference in your kitchen. When we got ours I found myself just staring at it. I told Robin over and over, "I love my new fridge". Just makes a gal feel good. You have waited sooo very long. Enjoy every single inch! I'll let you know if it is truly better than a trip to DL! lol! I agree...a new refrigerator is the best! Yours is beautiful! 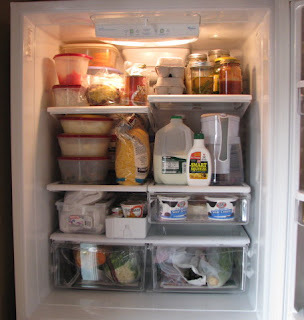 Thanks for sharing the inside ... you know, only with family would I look inside the fridge and look at how things sit. Thanks for being family! Oh, I love the pull out freezer drawer, too! Congratulations! Have a great week! Oh, sigh, a clean new fridge is a thing of beauty. And you, my dear, really know how to pack that thing within an inch of it's brand spanking new life! Good job!!! And congratulations on your new addition! Can you tell me what the model number is of your new fridge? Ours is quickly dying. We need to get a new one today or tomorrow:( Did you research consumer reports? You are always so good about finding the best deals. I really appreciate your sharing your finds with me. Amazing blog structure! The time to study or read or a visit to the subject material or web sites we’ve linked to beneath the. Appliance Repair in Bountiful Craigs offers a full range of brand new appliances to replace your worn out ones. Our Expert technicians also provide affordable repair and maintenance. This Week's Menu........The Late Edition!